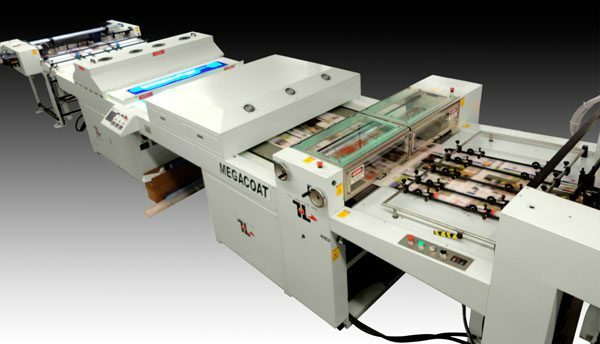 The MegaCoat UV Coater is a high production UV coater designed for the most demanding workload of mid/large offset printers looking to add flood UV coating offline. This machine is a cost effective alternative to the high cost of adding a UV coating station on press. It is offered in both 32” and 45” configurations to satisfy your accommodations. This versatile appliance is comprised of a high-capacity pallet load rear pickup steam feeder, heavy duty coating station with 7” diameter rollers, conveyor system with 4 IR lamps and 2 UV lamps and a pallet unload receding stacker. It is rated at 7,500 SPH at 20”x 28” and 5,500 SPH at 28”x 40”.